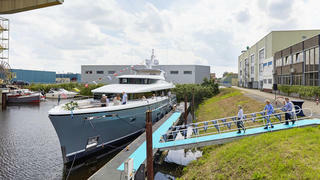 The first model of Moonen’s new Caribbean series, the 29.90 metre superyacht _Bijoux _has been delivered to her new owner. The Dutch yard hosted a delivery party this week (June 28) with live music and a festive atmosphere to celebrate this milestone in the company's history. The owners now plan to take a shakedown cruise to Malta, where the new model's giant stern swimming platform should come into its own. 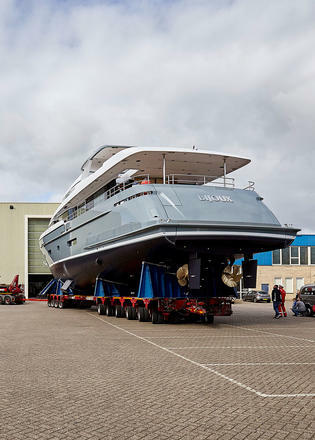 Boat International saw the hull in build last year in The Netherlands and heard more details about the Dutch yard’s new range, which is built “inside out” around the goal of meeting a particular tonnage. In the case of Bijoux, that is 200 tonnes, and the entire yacht is designed to come in at this mark when unladen. The exterior design of Moonen’s new Caribbean series is by Rene Van Der Velden, while the interior of the first Matica comes from UK designer Adam Lay. Clean lines, symmetry, balance, proportion and natural light are prominent themes, all set within a practical and liveable environment. Bijoux has a seven metre beam and 2.1 metre draft with a full displacement load of 220 tons. The top speed will be around 13 knots, but at a cruising speed of nine knots she’ll be capable of a 3,300 mile range. The raised pilothouse design includes a sun deck up top. The layout has the owner’s cabin situated on the main deck, together with the main saloon, with dining area, bar, and galley. The accommodation is split between five crew and three guest cabins on the lower deck. The yacht was built for an experienced owner, though this is the client’s first new-build yacht. They are moving up from a GRP boat and formerly spent a lot of time cruising in the Balearics. They now plan to expand their cruising reach to the Caribbean, fitting of the series' name. One of the key customisations on Bijoux was the shaping of the transom. “Many superyachts today have an open transom with a staircase either side,” continued van Zon. “The final design, however, features a fully closed transom, with only a small swimming platform for crew use. Moonen added that this level of owner customisation is available on all of its Caribbean series yachts. The Matica hull design is based on the well proven Moonen 97 with naval architecture by Diana Yacht Design, ensuring comfortable seakeeping and low fuel consumption. 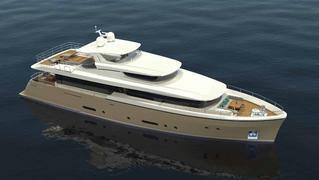 Her steeper bow gives a narrower entrance and a longer waterline, further increasing comfort at sea and fuel economy. The second launch in Moonen’s new Caribbean range will be the 36.58 metre Martinique superyacht, which is due for completion in August.